Native Advertising is touted as the Hot New Thing for marketing in 2017. You’ve undoubtedly seen some already. Swiping through your morning New York Times, you’re transported away from the endless slew of Trump you were ‘enjoying’ into something or other about Wi-Fi connected sinks, a “Paid Post” by Philips. It looks, sounds and reads like the rest of the NYT but it’s been planted there by a corporation ultimately looking to take your cash. Many are wary of native advertising and question its ethics. But it delivers exceptional value to marketers, a critical revenue stream for publications, and has been shown in some research to actually be preferred by many consumers to traditional advertising. Native advertising: crooked lies or blessing in disguise? Native advertising has been shown to be more effective than traditional advertising. It’s a neat solution for advertisers who have struggled for decades to overcome “ad blindness”, a problem exacerbated by ad blockers. It’s becoming especially difficult to reach younger consumers who a) are more media savvy b) hate being sold to and c) probably use an ad blocker. But package your advert into a story that’s as entertaining, compelling and informative as the surrounding stories and people may actually pay attention to your advert. Thanks to the slow-death of journalism you’ve got plenty of publishers willing to take advertising cash in exchange for their platform and hard-won credibility. What was probably once a red line for something as serious as the New York Times is suddenly a principal life line. Native advertorials like these work best when presented as nearly indistinguishable from the rest of the paper, and further studies have shown that the majority of people ignore the “Paid Post”, “Sponsored By” or “Promoted By” disclaimer at the top – skimming over it the same way they’ve learned to ignore traditional advertising. So the problem is that readers are potentially deceived, thinking they’re reading the usual “unbiased” reporting of their favourite publication, when in fact they’re reading something specifically designed to wrench their salary from their wallet in exchange for goods and services. This is usually benign, but it can be seriously misleading – like when energy companies hijacked the pages of The Denver Post to push their agenda. Leaving nefarious energy companies aside (they will always be nefarious), if the story is clearly labelled as sponsored, is there really a problem? People are increasingly fed up with being sold to, ably demonstrated by the enormous growth in ad-blocker use. Native advertising allows brands to continue to advertise, to a more receptive audience, who may actually enjoy the content – after all, it is designed to appeal to the brand’s target demographic, placed in a relevant publication. If they don’t enjoy it, it’s not achieving its aim. It’s also a chance for marketers to frame their product within a more coherent narrative, placing it within the context of a lifestyle or idea more than they can with simple, one-shot advertisements. An excellent example is Buick’s Buzzfeed advert, extolling the virtues of their new 24 hour test drive by taking readers through a relaxed Saturday with the car. Or it can act as an extension of content marketing (where brands publish on their own channels e.g. a blog) and not advertise anything directly at all – simply serve as a mouthpiece for the brand’s positioning, building both authority and brand loyalty in one fell swoop, taking advantage of the publication’s (highly relevant) audience to do so in such a way as not to be ignored. So maybe, just maybe, if it’s executed well and properly labelled as advertising, it might be a good thing? Consumers like it, brands like it… But then, of course, the same thing used to be said about cigarettes. In a time when biased, misleading or outright fake news is being blamed for a far-right President in the White House, do we really want to be introducing potential conflicts of interest into traditionally trustworthy sources? Probably not. In fact, in one survey on native advertising, people showed a clear nonchalance about the appearance of sponsored content in somewhere like Buzzfeed, but active concern about its appearance in the New York Times. After all, there’s not much to be compromised in Buzzfeed. But serious news is the blood that fuels a well-functioning democracy. And although there has always been a tension in advertising-funded journalism – can you openly criticise Shell on page 3 and display their advert on page 7? – the tension is even greater with native advertising, where the inconsistency would undercut the credibility of the advertorial, and therefore the desirability of advertising in that publication. But. It has to be said. Journalism has to be paid for somehow. And if we are no longer willing, as citizens, to pay appropriately for it – as we did in the olden days of the daily paper – we must accept native advertising as part of the alternative. So what’s the bottom line? 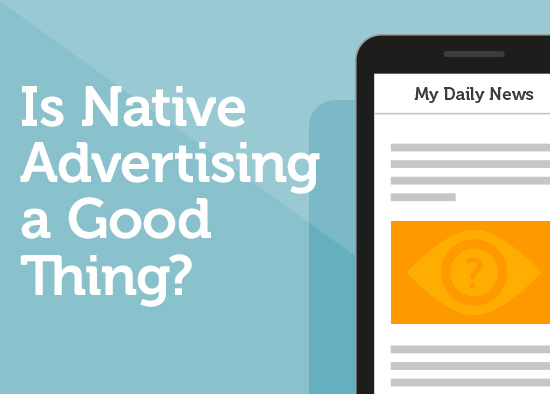 Is native advertising a good thing? Yes and no. Like most things in life. Yes if it’s properly executed, well-intentioned and properly labelled. No if it’s deliberately misleading and instigates potential conflicts of interest in publications whose credibility is consequential to the rest of society.